- Please send ARTIST RELEASES to this email. The Deli Magazine is a daily updated website covering 11 North American music scenes (thus far: NYC, LA, Seattle, Nashville, Chicago, San Francisco Bay Area, Portland, Austin, Philly, DC Area, Toronto and New England) through 12 dedicated, separate blogs. We also have a quarterly publication exclusively focused on the NYC independent music scenes - and a yearly magazine focused on the SXSW music festival in Austin. The Deli covers a wide spectrum of genres, including Indie, Alt Rock, DIY, Post Punk, Singer Songwriters, Roots Music and occasionally also Metal and Hip Hop. All these and other genres are included in our Web Buzz Charts organized by genre and regions, which are our own way to celebrate, organize and highlight the local communities of musicians and their music. The primary goal of The Deli is to expose local artists that are not yet established enough to live through their art: this is why all of our printed articles feature only up and coming bands and singer-songwriters (while our charts also cover the most popular breakout bands). The secondary goal is to inform the NYC community of musicians on any other matter related to making music, from recording it to promoting it and performing it. You will find this kind of information in our Delicious Audio Blog and Listings section. The Deli covers music regionally (i.e. if you are based in NYC you will be covered in our NYC blog). We only accept digital submission through our digital submission system here. 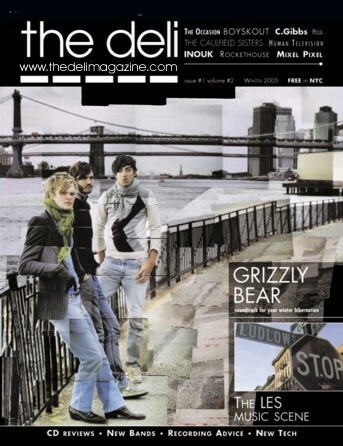 The first issue of The Deli, published in December 2004.